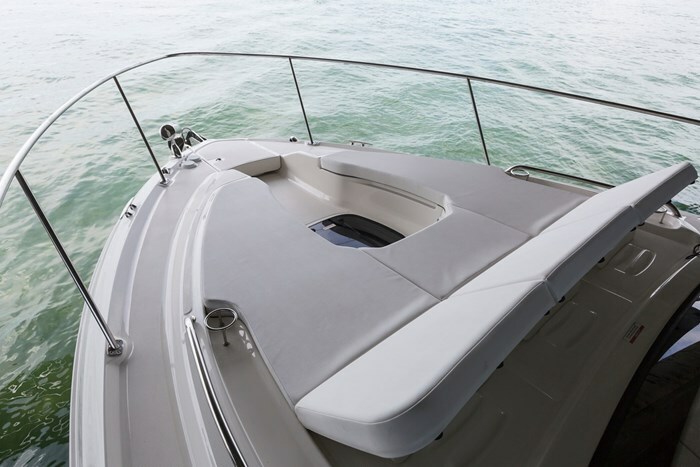 Sea Ray’s Sundancer 350 Coupe is an all-new model and design for 2017. 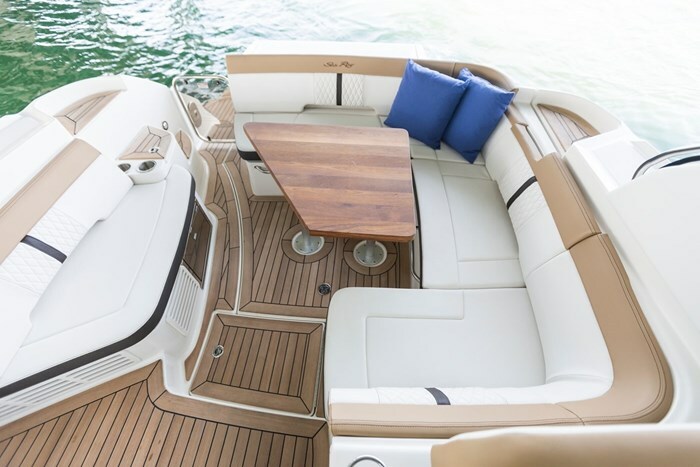 It is one of twelve Sundancer models from twenty-six to fifty-four feet and one of a total of forty-one models in six series ranging from nineteen to sixty-five feet that comprise Sea Ray’s lineup for 2017. This new Sundancer 350 Coupe does not replace the Sundancer 350 which is still in the line-up. The 350 Coupe is recognizable for its full hardtop attached to a one-piece windshield and full side windows. Both boats share interior and cockpit layouts and features. 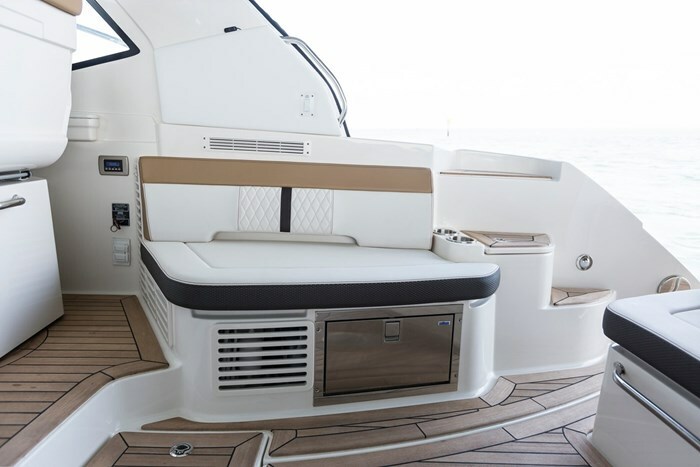 One of the new features on the 350 Coupe that it does not share with its sister Sundancer350 is found on the foredeck which is essentially one giant U-shaped sunpad with a central recessed portion within the foredeck mold to provide foot room for full surround seating plus full-out lounging down the sides and complete with adjustable, articulating backrests, cupholders, and integral speakers. 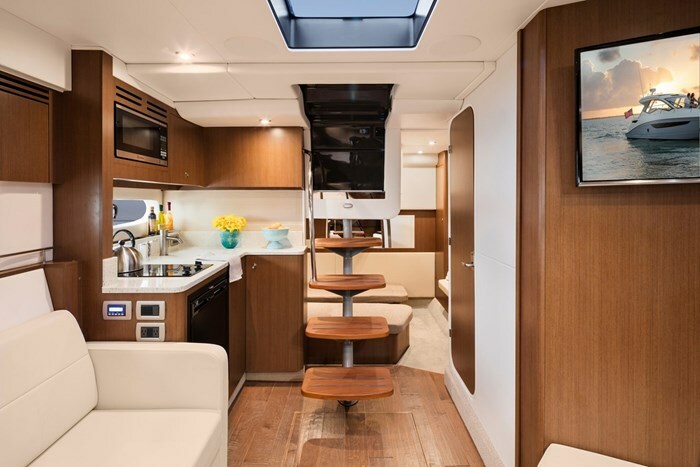 A starboard side acrylic transom door from the integrated swim platform leads to the lower cockpit area which features a starboard side bench seat facing a huge port side C-shaped lounge with fibreglass table and convertible to a sunlounge. 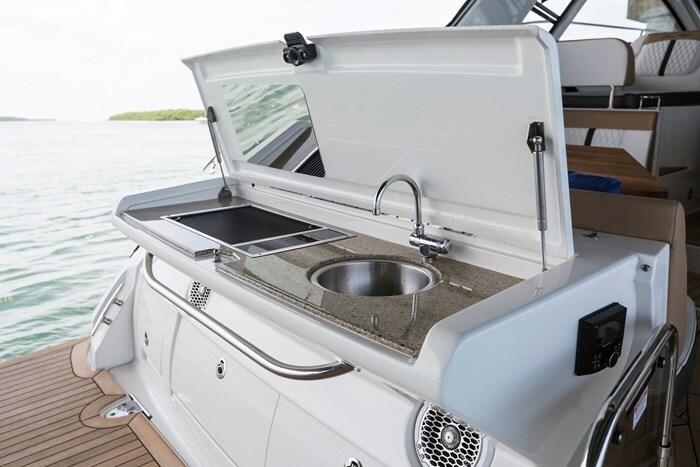 There is transom storage, underseat storage, plus a carry-on cooler with dedicated storage. The coupe hardtop has not only an opening fibreglass sunroof but also a forward facing opening vent. The aft portions of both side windows also slide open. 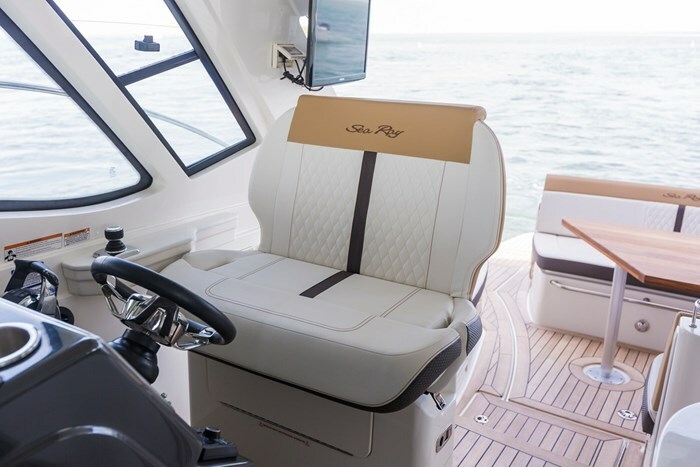 Opposite the helm is a port side lounger seat while the adjustable helm seat with flip-up forward bolster pivots around to face this passenger lounger or right around to enhance socializing. 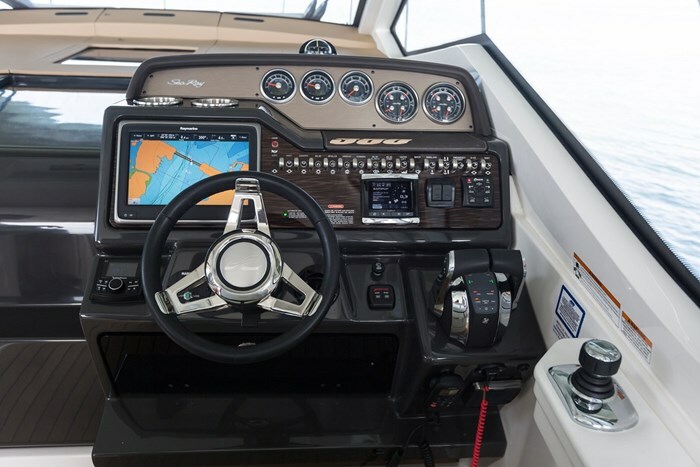 The wood-accented tilt steering wheel faces a tiered helm station with standard SmartCraft® diagnostic instrumentation including all normal engine readouts plus air and water temperature, depth, fuel consumption, hour meters, etc., leaving lots of room for an optional flush-mounted navigation screen. Trim tabs are standard as is a VHF radio and stereo remote. Four teak stairs lead from the cockpit sliding door to the cabin below. 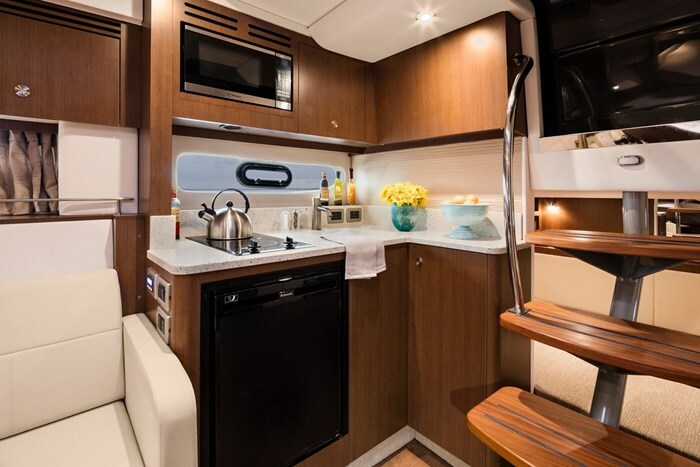 Immediately to starboard is an L-shaped galley complete with stainless steel sink, refrigerator, microwave, two burner Pups® electric stove, plus cupboards. 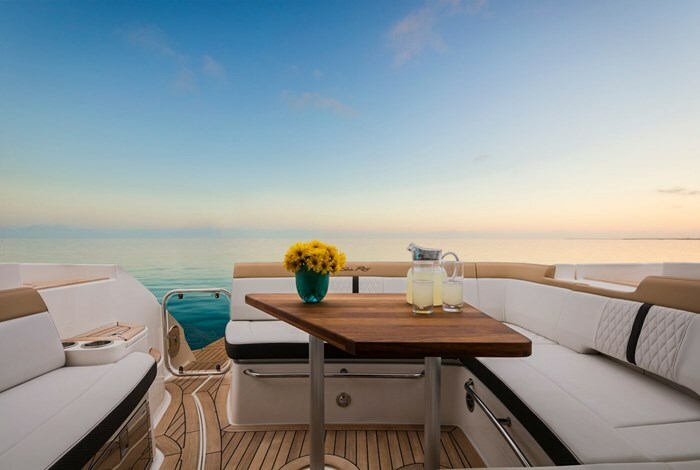 Ahead of the galley is an L-shaped convertible settee with wood table with designated storage and a facing smaller settee on the starboard side. 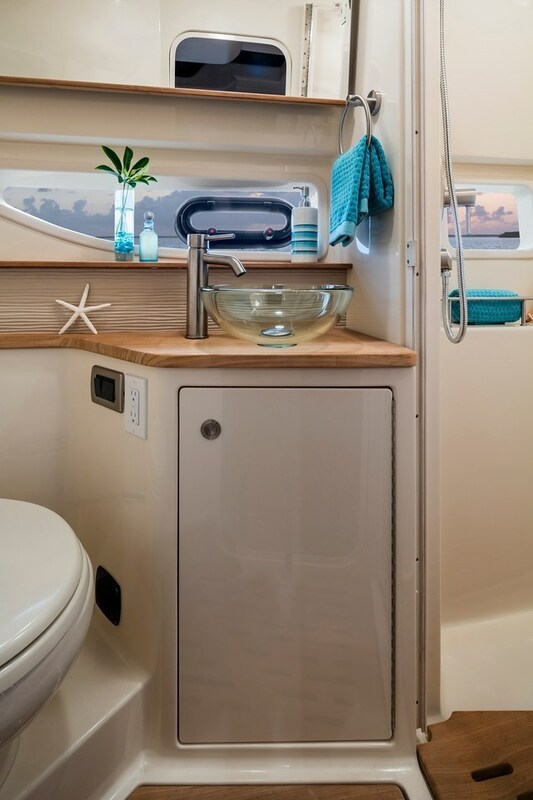 Opposite the galley is the head compartment with separate shower stall, simulated teak flooring, VacuFlush® head, vessel sink, medicine cabinet, storage, plus full-length mirror. The wood-trimmed mid-cabin features twin beds that convert to a double berth with slide-out base and dedicated filler cushions. There is storage in the mirrored bulkhead plus drawers plus a hanging locker. The forward V-berth Island-style double berth is fitted with a Visco Elastic memory foam mattress plus fitted neutral sheets. Storage drawers are provided as is a hanging locker. Air conditioning/heating is standard in the cabin as is an LED Smart TV with remote Blu-ray™ player and gaming system port, accent pillows, and a Rockford Fosgate® AM/FM sound system with wireless Bluetooth™, eight speakers, amplifiers, and subwoofer serving the cabin and cockpit. 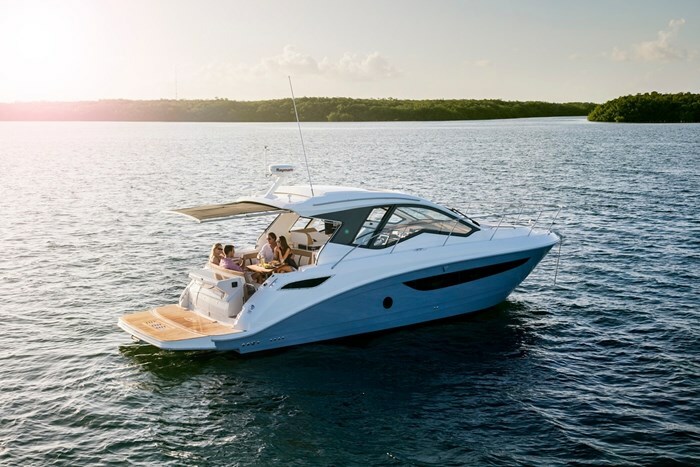 Standard power for the Sundancer 350 Coupe is from twin 350 horsepower MerCruiser® 6.2L MPI sterndrives with DTS (Digital Throttle and Shift) and with Bravo® III outdrives. Optionally you may choose twin 380 hp MerCruiser® 8.2L MAG sterndrives and then add Axius® joystick control to either choice. You may also choose gas or diesel V-drive power or diesel sterndrives. Other notable standard equipment includes large hullside fixed windows providing natural lighting below, windshield wipers, bottom paint, anchor windlass, battery charger, automatic fire suppression system, freshwater washdown spigot, plus a transom shower. 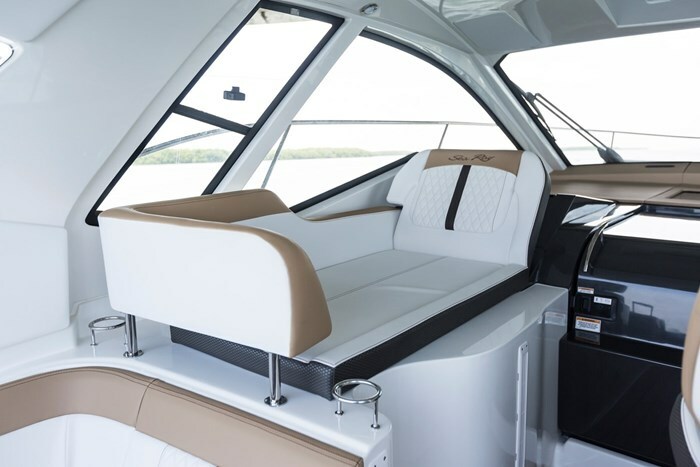 There is a substantial list of optional equipment but the notable items include two choices each of gas or diesel generators, an enclosed mid-cabin bulkhead with privacy door, extended retractable electric cockpit sunshade, Raymarine a125 chartplotter with or without radar, most informative SmartCraft® VesselView displays for gas engine choices only, cockpit air conditioning/heating, five hullside colour choices, windshield defroster, extended swim platform with or without hydraulic submersible extended step, transom gourmet station with sink and grill, Seagrass™ or teak cockpit flooring, teak cockpit table, cockpit refrigerator, stereo and TV and lighting upgrades, central vac, remote spotlight, and opening portlights with screens in the cabin.